There's a difference between always being negative like wjb was, and being critical of how things are working. I'm usually overly positive when it comes to expectations and seeing the good, even in a loss, but after a win we can still see some wrong, doesn't make us fair weather fans. The talent on this team should be having this type of result every week. And when we don't because of inconsistent play, that falls on the coaching. We're accustomed to min-maxing the roster every season. We draft to increase the talent at a certain position. Why shouldn't the speculation include the coaching staff and upper management. Aren't they part of the entire process? Most games come down to 1-2 plays difference that can swing a game. Bad decisions consistently by the coaching staff are that much more amplified. Same with roster moves made by the GM or contracts signed by Leyland. We're not bad people for questioning whether or not after 5 seasons, a change should be made to improve the team. I can understand wanting to bask in a big win, but with 10 days off, the questions are still going to be asked Just like the players can't sit on their laurels before heading to philadelphia next week, don't expect the fans to sit on theirs when there was still plenty of bad in this win. I haven't seen anyone call you fair weather fans. I know you aren't or you would not have been anywhere to be found in the 0-16 season. I just think that most of those turn overs were the result of just plain dumb luck. They will happen. There are some of them that can and should be corrected. But, I believe that Schwartz can and will get them corrected. I am totally against even risking the next Wayne Fontes firing. And that is exactly what I believe we will get if Schwartz is fired. We are 5 years into Schwartz's first NFL HC gig. Guess what? That is usually how long it takes for a first time HC to get everything figured out. So, let's just fire him at the end of the season before he puts it all together. And who says that he won't have the Lions at their peak for the Playoffs? Don't you know that as a Lions fan, you're only supposed to make NEGATIVE projections, not positive ones! That's Lions Fandom 101, rookie! I understand your humor there. But, look at my username. That should suggest that I am anything but a rookie. LOL. Like I said, I'm a long-time lurker who got sick of posting to mlive. I hear ya. Though there are some haters here, at least you guys know football. Much respect to the level-headed fans, to include yourself, Sims. On this site we don't have a lot of haters, but we don't have a lot of fanboys either, which is great IMO. When it comes to replacing a HC you have to view it as you would any other player. Is the talent enough to take us to the NEXT level. Swartz has done a pretty decent job of establishing a comet active (ok that was supposed to say competitive, but the auto correct was so awesome I'm leaving it!) team, but does he have what it takes to form an elite team? At this point and time the signs lead to no. Doing better than expected is one thing, but do you really see us taking the division if cutler or Rodgers stay healthy? I don't...which means we wouldn't sniff the playoffs this year if it wasn't for their misfortunes. That does not an elite team make. And fear of the past is no reason to settle for mediocrity IMO. If we are smart about a coaching change then there is no reason to fear the same result as the post Fontes era. This is a different GM, and it seems silly to hold the sins of his predecessors against him. Just because a person has "earned" the right to do something, doesn't mean that right should be exercised. Suppose I had the right to slap the crap out of someone. Should I do it? No. Crap splatters. Second guessing draft picks isn't really what the discussion is about. That is going to happen. From virtually everyone. That don't sink into the mindset of the players like the constant drumbeat of negativity does. Have you ever heard of the power of positive thinking? If you were constantly ragged on or if you were regularly treated well, which environment would you function better in? Now multiply your right to have a poor attitude times more than a million fans. And place yourself in the shoes of any 1 of the 53 players on the Lions. Which environment do you think they could function better in? Just because you have the right to be ornery, doesn't mean you should. Completely different situations Billy. First off, we don't speak directly to the players, and I highly doubt any of them gives two cents about what the fans are saying on a forum like this. Secondly, if someone lets you down over and over again, telling you things will be better but they don't really improve all the much, would you continue to believe them? If you did, it makes you a naive fool, nothing more. As I said, being a fan doesn't equate to blind loyalty. Just because this team is better than what we were given during the Millen years doesn't mean they should be heralded as a great team. Like or not, accept it or not, this team should be in much better position than 7-5 right now. If losing to two teams with losing records in consecutive weeks, one of them at home, is acceptable to you, then you are accepting less than what you and every other Lions fan deserves from this team. The stadium gets filled, their merchandise gets purchased and their games draw big crowds to the TV sets in this area. Detroit fans deserve a team that accomplishes more than just mediocrity. Aside from their beating Green Bay quite handily, this has been a season of mediocrity....or less. While there may be some individuals having some really good seasons, like Levy and Calvin, the mistakes continue to hurt this team. And each week the promise is made 'we will work on that' or 'we will get that fixed' or 'I won't fumble again this season'. It's the little boy who cried wolf. Up and until this team accomplishes something of note, beyond backing into the playoffs due to other teams injuries, I and others will be critical of their performances. It will happen here, it will happen at other forums and it will happen in the media. If you can't take it, then stop reading. With a better secondary, I see this Lions team as unstoppable. You can have individual players that are sub-par, but you can't have entire position groups that are sub-par. I do not think this team is capable of doing deep in the playoffs, but that has very little to do with Schwartz, IMO. The thing that's holding back this team is their secondary. With a better than average secondary, who is going to beat the Lions coached by Schwartz? Green Bay? Nope. Their defense is god-awful outside of Shields and Matthews and do not have what it takes. Reminds me of the lions last year. Chicago? Cutler goes down every year at some point and their defense isn't getting any younger. But maybe, though not consistently. After all, they were beaten twice by the Lions this year. Minnesota? First, they need a quarterback, then we'll talk. In theory, the Lions could own the NFCN for years to come with just a few additions. Secondly, again, the injury bug bites every team. It bit the Lions hard for a few years and the NFL didn't feel sorry for them and hand them wins. Injuries are part of the game. Unfortunately, the 11 players on the field doesn't make up the team. The reason the Lions sucked for so long has a lot to do with depth. Do you think I apologize when the Lions beat a team with a few injuries? No, those teams should have more depth. Don't depend on one guy so much. That's why the d-line of Detroit is so good. If any one player, Suh included, goes down, the Lions aren't looking at losing every game until he's healthy. Likewise, GB should have a serviceable backup QB and so should Chicago. I'm not apologizing because the Lions beat them with their #2 QBs, nor would I expect an apology if Hill goes in and loses games. Injuries aren't an excuse, they're a fact. We could play the game on paper and say Rodgers would've beaten the Lions, but the fact is that the Packers defense had a lot to do with it. One unit goes down, another steps up. That's life in the NFL. And shame on the Packers for being so reliant on one player, that's their fault. Develop a better running game, develop a backup QB, have a defense that doesn't give up 40 points and 500 yards. But I won't marginalize the win. It's my belief that Rodgers would've lost as well as Flynn did. Maybe the score isn't 40-10, but it still goes in the W column. I agree that the Lions biggest need is an improved secondary, primarily at cornerback. But getting good cover corners isn't an easy task, and as that need is filled other needs will arise. Still, there have been other teams with less than stellar secondaries that have not only gone deep into the playoffs, but have won Super Bowls. You can't hang the whole thing on the secondary. Green Bay's defense is awful? I agree they aren't tops in the NFL, but I wouldn't call them awful. Charles Woodson not being around has hurt them, but I think they have just as much talent on their defense as the Lions do, perhaps more. And just as easily as the Lions can fix their secondary, the Packers can fix any positions on their defense. Chicago, I agree, has an aging defense and in a year or two they will likely be struggling to stop anybody unless they focus their entire drafts on that side of the ball and are able to pickup some good talent. Minnesota has far more issues for them than just at QB, but that is their single biggest flaw. Can the Lions dominate for years to come? Perhaps. But first they'll have to win the games they're supposed to win on a far more consistent basis. If you don't think that's on the coach, then it's on the players and that means they need more than just secondary help. Nobody is saying we should pity the other teams. What we are saying is that if the Lions win this division, it won't be strictly on their own merit. Yes, they beat the teams they beat, and whether those teams were missing one guy or twenty doesn't make a difference on the won-loss column. But when you gauge a teams performance, you do it against the first line players not against the backups and scrubs. When Stafford was hurt, Lions fans made the same excuses then as the Packer and Bears fans are now. When CJ was hurt in the first meeting between the Lions and Packers, Lions fans were using his absence as an excuse. When it comes down to it, what I want is a team that is far more consistent and wins when they are supposed to win. Whether you want to accept it or not, the losses against Tampa Bay and Pittsburgh loom very large as to just how terribly inconsistent this team is, performance wise, and until that gets squared away this team will struggle to make the playoffs, or win in the playoffs. Right now, if the playoffs started today, the Lions would probably lose to whatever team they would have to face. Seattle, Carolina and New Orleans would destroy them. San Francisco or Arizona would be a close game. And I don't know exactly what they would do against either Dallas or Philly. It depends on which team shows up? The team that faced Green Bay on Turkey Day, or the team that played like a turkey against Tampa Bay? Then again, the playoffs are a full quarter of the season away - a lot can happen between now and then including the Lions heating up and getting hot at the right time. Now, go back and look at some of the more recent SB champs - how many of those teams were inconsistent? The Ravens last year won 10 games, but lost 4 of their last 5 games then slipped by the Broncos in double OT in the playoffs - did anyone give them a chance to be champs? Then we had the Giants slip into the playoffs at 9-7 the year before, at this point of the year had lost 4 straight before nipping the Cowgirls by 3, got spanked by the Skins, before winning their last 2 games to make the dance and go onto win. How bout the Packers the year before that, remember when the dreadful Lions beat them in December, the Pats beat them the following week before they won their last two and snuck into the playoffs at 10-6 (thanks to the Lions for knocking the Bucs out for them). I guess all of us experts had the past 3 winners first making the playoffs and then making deep runs all the way to the trophy? Inconsistency has beaten consistency a lot as of late once the playoffs start. Make the dance, then ask the prettiest girl to have a go and see what happens. Enjoy the ride fellas, it is pretty rare in these parts. Fair question. I Never have and never will root for the Lions to lose on gameday, despite anything I may say on forums. Even if its for a way higher draft pick in a meaningless last game of the season. If Slay can turn the corner, this could be, in my mind, the best draft we've ever seen. Supposing Slay continues to progress, out of 7 picks in the first 6 rounds, the Lions will have hit on 6 of them. 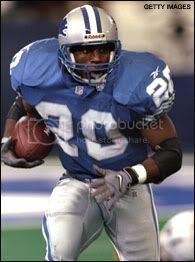 I'm going to assume that not many NFL teams hit on 6/7 of their draft picks in the same year and the Lions went out and got Reggie Bush who has been invaluable despite his recent fumbleitis. While not drafted these 2 were apart of the draft Process, and also Huge gets for Mayhew/Lions.